For years, Microsoft and others have been trying to figure out how to get Windows running on chips other than x86 processors most commonly made by Intel and AMD. The hope is that by broadening the platform to makers of mobile devices, Windows on ARM-based chips will lead to cheaper, more accessible systems than the standard laptops we have now. Microsoft’s first major attempt was with Windows RT back on the original Surface, but that went so badly, it almost tanked the entire platform. Then, for years, the topic was largely forgotten until late last year. In December 2016 Microsoft announced a partnership with Qualcomm to bring full Windows 10 (and not some gimped RT-like variant) to Snapdragon processors—the same family of chips found in most Android phones. That brings us to now, where almost another full year after that initial statement, we finally have some real Snapdragon-based systems running Windows to talk about. In short, Windows on Snapdragon allows processors based on ARM (instead of x86) to run the traditional Windows 10 experience that you’re used to. The processor slated to be used in the first batch of devices is Qualcomm’s Snapdragon 835—the same chip found in phones such as the Galaxy S8, Pixel 2 and OnePlus 5. Representatives from Qualcomm said that because the next-gen chip was still in development during test for Windows on Snapdragon, it wasn’t possible to ensure full compatibility at this time. While the idea of supporting a different architecture might not seem like a big deal, this development opens the number and type of devices that support Windows 10 to a whole new range of chip and laptops makers. In the long run that could increase competition and drive prices of Windows systems down. Sounds good right? But that’s not all. What are the the benefits of Windows on Snapdragon? Despite the original goal for Windows RT to offer a more affordable Windows experience, the first wave of Snapdragon Windows devices are going to be in the $800 range, so not actually cheaper than traditional x86 systems. Instead, the main advantages of Windows on Snapdragon should be better power efficiency (i.e. better battery life), better internet connectivity thanks to always-on integrated 4G LTE modems, and silent operation due to fanless system design. Qualcomm also says that because of the smaller physical dimensions of its chips version traditional x86 processors, laptops running Windows 10 on Snapdragon should have more thermal headroom and thus more consistent peak performance, and smaller physical motherboards which means more room for bigger batteries. Imagine putting the guts of a smartphone into a laptop body, and then think of all the space you’d have left over. That last part about battery life could be a big deal, because instead of small one or two hour improvements to battery life, Windows Snapdragon machines could have double, maybe even triple the longevity of x86 devices. Though once again, that’s a big “if”. I’m going to wait until I can test it myself to say those claims are legit. The clear disadvantage to Windows on Snapdragon is raw computing power. Qualcomm says that for most things (web surfing, video playback, typical productivity), its Snapdragon 835 chips will perform similarly to their x86 equivalents. Qualcomm hasn’t provided any examples of what an equivalent Intel Core i chip would be, but we’re guessing the Snapdragon 835 will deliver performance somewhere between a Core i3 and Core i5 processor. On more intense tasks like serious gaming, 3D modeling or photo and video editing, traditional Intel or AMD chips are still going to be king. You can think of it like this: If you tend to use a lot of x86 apps or prefer the kind of performance you get from systems with Intel Core i7 CPUs, Windows on Snapdragon probably won’t do much for you. However, if much of your time is spent using cloud apps like Google Docs, surfing the web or making Powerpoints, and you care about mobility, these new ARM-based laptops will be worth considering. There are also little issues that could stem from the way Windows on Snapdragon works. Since apps on the Microsoft store were originally designed to run on both x86 and ARM processors, there’s no problems there. However, traditional x86 programs—what Qualcomm is calling “legacy apps”—get run through an emulation layer. This can cause some hiccups, especially during installation, where certain programs, such as VLC, Skype and Adobe Reader, take an extra 10 to 30 seconds, or about twice as long to install. The emulation should all happen seamlessly in the background, so you won’t have to worry about configuring virtual desktops or installing stuff like Boot Camp on macOS to get software to play nice. What kind of Windows systems are getting Snapdragon chips? 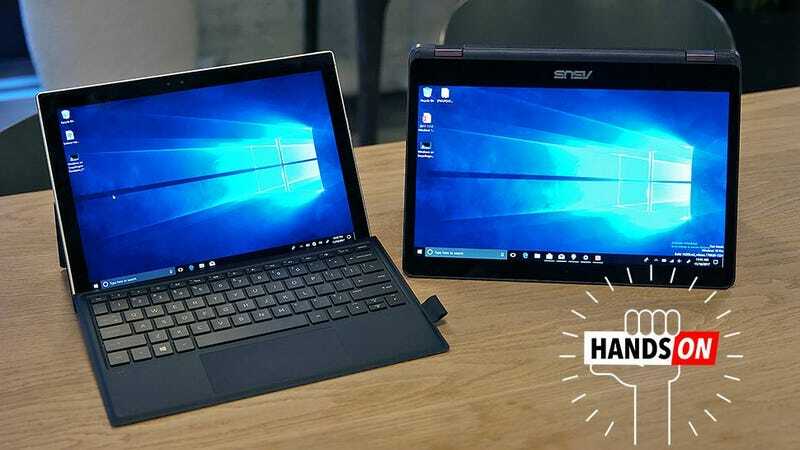 Currently, Windows on Snapdragon devices all look to be some type of 2-in-1, whether its something with a 360-degree rotating hinge like the 13-inch Asus NovaGo, or a Surface Pro-like detachable such as HP’s Envy x2. Earlier this year, Lenovo also pledged to make a Windows Snapdragon device, however it doesn’t seem like it will be ready to show off until Q1 2018. Though it’s possible we may see something in early January at CES . Honestly? Almost exactly like a regular Windows 10 PC— and that’s a good thing. Unless you dive into the task manager or take a peek as the system info, it’s pretty difficult to differentiate between Windows 10 running on Snapdragon and Windows 10 running on x86. Granted, I only had a short time to check out both Asus’ and HP’s new systems, but installing and running both legacy x86 software and UWP (Universal Windows apps) from the Microsoft store worked exactly as I expected. And the lack of fan-noise on both the Asus NovaGo and the HP Envy x2 is a nice bonus for people who appreciate a bit of peace and quiet. That said, there are a number of fanless x86 Windows laptops, so that’s not exactly a unique advantage. When will this stuff be available?